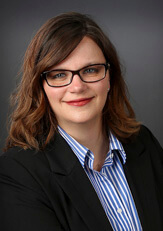 Heather J. Halverson | Fafinski Mark & Johnson, P.A. Heather Halverson focuses her global practice in the transactional areas of commercial aviation, corporate aviation, aviation sales and use tax, corporate finance, and general corporate and business law with an emphasis on tax related issues. Prior to joining Fafinski Mark & Johnson, Heather served as corporate counsel of one of the nation’s largest retail home improvement chains. This experience has provided her with a unique legal perspective and the ability to understand and appreciate her clients’ business procedures, policies, and goals, which she incorporates into all aspects of their business ventures. Heather was recently named to the “Who’s Who Legal: Transport 2017” list for Aviation Finance. Heather currently resides in the SW metro where she spends her free time coaching recreation soccer and in-house basketball for her twin daughters, Lilly and Ellie, and son, Preston. She is an avid reader and loves the year-round outdoor adventures that Minnesota so plentifully provides. As a product of Wisconsin and of Chippewa Falls, Heather enjoys rooting for the Badgers in football and basketball while enjoying the hometown brew, Leinenkugel’s.